Googling Poonah in 1907, or What’s in Your Workbox? 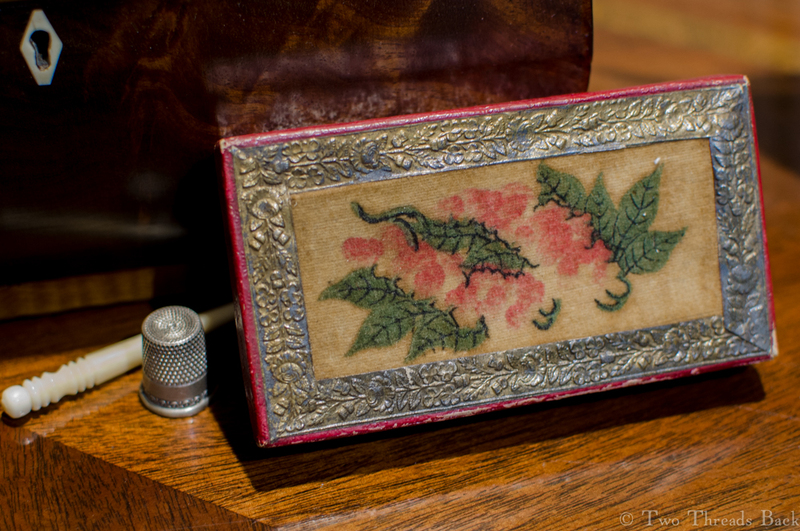 19th century paper box with theorem-painted velvet lid. At least I think that’s what it is, I don’t know for certain. Additional information welcome! I’ve always had a thing for little boxes, and when I came across this one I was delighted. I’m not sure why, because it’s not especially pretty now. It probably wasn’t a whole lot better in its own day! But it’s just the sort of trinket I like to put in a workbox to add, um, character. The painted velvet on top was intriguing, and it didn’t take a lot of searching before I began to see the term “theorem painting” pop up. Apparently it was all the rage with crafty ladies in the early to mid-nineteenth century. It was a type of stenciling that was supposed to be very easy to do, although it wasn’t held in high esteem by the Genuinely Artistic. While browsing some ladies’ magazines of the era, I finally made the connection between theorem and Poonah painting. And I learned that it doesn’t take long for a fad to fade! What on earth was a body to do in the days before search engines? Well, in 1907 J. A. H. Murray of Oxford went to the Google of his day, Notes & Queries, a Medium of Communication for Literary Men (cough cough), General Readers, Etc. 1907. After all this, the word does not, so far as I see, occur in any dictionary, and is even entirely missed by ‘ The Encyclopedia Britannica ’ and The Times Supplement. What were poonah painting and poonah paper? What is a poonah brush? Speedy information is desired. J. A. H. MURRAY. Oxford. Don’t you just love how he came up with the same kind of snippets that Google does? What on earth would he think of how fast “speedy” is now! His search wasn’t over, however. Readers speedily came to his aid with more information, just like a special interest forum today. POONAH PAINTING- ​Two well-remembered accessories of my golden age were a tubby little copy of ‘ The Boy’s Own Book,’ inherited from an earlier generation, and a smart, red-coated, gilt-edged volume which offered itself as ‘The Girl’s Own Book,’ and was, compared with the other, “ as moonlight unto sunlight, and as water unto wine.” It was, however, of it that I thought when I saw Dr. Murray’s question, for I believed that it conveyed the mystery of Poonah painting; and, having obtained the loan of the book from a working nursery, I am glad to find that I was right. I have before me a copy of the fourteenth edition of ‘ The Girl’s Own Book,’ by Mrs. Child (author of ‘ The Mother’s Book,’ ‘ Frugal Housewife,’ ‘ Mother’s Story Book,’ 820. ), which was published by William Tegg & Co., Cheapside, in 1848. POONAH PAINTING. This style of painting requires nothing but care and neatness. The outline of whatever you wish to paint is drawn with the point of a needle on transparent paper, and then cut out with sharp scissors. No two parts of the bird, or flower, which touch each other, must be cut on the same piece of paper. Thus on one bit of transparent paper I cut the top and bottom petal of a rose; on another piece I cut the leaves at the two opposite sides, &c. Some care is required in arranging the theorems, so that no two parts touching each other shall be used at the same time. It is a good plan to make a drawing on a piece of white paper, and mark No. 1 upon all the leaves you can cut on the first theorem, without having them meet at any point; No. 2 on all you can cut in the same way on the second theorem, and so on. After all the parts are in readiness, lay your theorem upon your drawing paper, take a stiff brush of bristles, cut like those used in velvet colours, fill it with the colour you want, and put it on as dry as you possibly can, moving the brush round and round in circles, gently, until your leaf is coloured as deep as you wish. Where you wish to shade, rub a brush filled with the dark colour you want, carefully round and round the spot you wish to shade. Petal after petal, leaf after leaf, is done in this way, until the perfect flower is formed. No talent for drawing is necessary in this work; for the figure is traced on transparent paper, and then the colours are rubbed over the holes, in the same manner they paint canvass carpets. In the choice of colours, you must be guided by the pattern you copy. The light colour which forms the ground-work is put on first, and the darker colours shaded on after it is quite dry. Green leaves should be first made bright yellow; then done all over with bright green; then shaded with indigo. A very brilliant set of colours in powder have been prepared for this kind of painting; if these be used, they must be very faithfully ground with a bit of glass, or smooth ivory.If the colours are put on wet, they will look very badly. The transparent paper can be prepared in the following manner: cover a sheet of letter-paper with spirits of turpentine, and let it dry in the air; then varnish one side with copal varnish; when perfectly dry, turn it, and varnish the other side. I hope the above description of Poonah-painting method may satisfy DR. MURRAY, but I should require something more lucid if I wished to practise the spurious art. The part about the paper is clear enough. I possessed some which I inherited with an old paint-box. They were round, flat ended, and perhaps from a quarter to half an inch in diameter. I think DR. MURRAY postdates the vogue of Poonah painting by about twenty years. It was not fashionable in 1856. ST. SWITHIN. My recollection of Poonah painting as a boy is that it was a kind of stencilling. Poonah paper was a sheet of some rather thick, semi-transparent substance. Out of this were cut the shapes of leaves, petals of flowers, &c. The Poonah paper was laid on the paper to be ornamented, and colour applied to the cut-out spaces with a stiff brush cut flat at the end. The apertures were moved about till a perfect flower had been formed. SHERBORNE. Another view with the flowers turned the other way. I’m not sure what kind they are, and I don’t know which is right side up! Maybe it doesn’t matter. 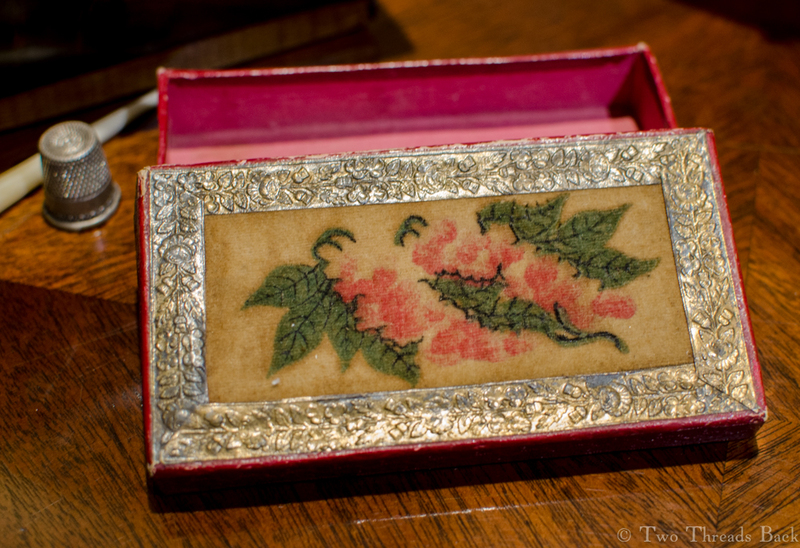 This entry was posted in History and tagged Antique Sewing Tools. Bookmark the permalink.